An Imugi that failed to become a dragon cannot survive in the material world for long. That was because it failed to become an immortal being selected by the heavens. ‘It’ was in a similar case in the past, too. The day where there was quite a bit of rain. ‘It’ used up all the power it had in order to ascend. Already, a half of his body had turned into a dragon’s. Once he ascends, his other half will also transform, turning him into a full-fledged dragon. But unfortunately, the gate of heaven did not open on that fateful day. ‘It’ settled it’s tired body in the bottom of the Dragon Pond (龍泉). It was waiting for it’s death quietly. The being that was neither a dragon or an Imugi. ‘It’ was fated to soon die and disappear from the world forever. The one that appeared in front of the dying being was a human, something that ‘it’ regarded as worthless before. When it opened it’s eyes, it could see something in front of it. A thin human male. A weak human that didn’t even look like it could lift a twig. However, ‘it’ was currently very weak. At this rate, he would be thrashed by this weak human, and spit out his Neidan (內丹) and die. That was the fate of most imugis that failed to ascend, after all. Having his stomach cut open by a human, and having his Neidan ripped away from his body. ‘It’ quietly accepted its fate, but the human simply stood there, looking into the pond for a long time. The human didn’t look afraid at all, even when looking at a giant half-dragon half-imugi monster. Actually, he had an excited look on his face. ‘It’ looked up towards the human. ‘It’ then proceeded to smile. Those eyes the human possessed were something that you’d attain once you surpassed the limits of the human race, wasn’t it? ‘It’ was happy that it got to see something so rare before death. ‘It’ didn’t respond, and shut its eyes under the pond. ‘It’ wanted to rest. Come to think of it, ‘It’ used up too much energy. ‘It’ used up too much time of its life polishing its power. Now that ‘It’ had failed, it didn’t want to do anything. ‘It’ just wanted to rest. ‘It’ snorted in amusement. The human was insane. There was no way to hide its giant body in this world. Its body had turned too big because of the half of his body becoming those of a dragon’s. This world could not support a massive body like that. ‘It’ would slowly get dissolved away from the world, and die. Lucky? Who’s he kidding? The man stretched out his hand towards the pond, not caring if ‘It’ would get angry or not. That was the first meeting between ‘It’ and Zhuge Liang. Zhuge Liang smirked. But he knew. He knew that this new friend of his, even though it failed to become a dragon, still held immense power……. Zhuge Liang leaned back on his chair, and spoke. There was no one who could understand Zhuge Liang’s teachings in the present world. The fate of having no disciples. That ultimately meant that his knowledge would fate away once he died. ‘It’ twisted its body to look at Zhuge Liang, and smiled. ‘It’s face turned extremely serious. The past or the present, humans made promises that they’d never be able to keep. ‘It’ paused, and began to think. After a moment, ‘It’ shook its head. Zhuge Liang smiled. And that was how a thousand year old promise was made. ‘It’ was saved that time, by that man. Perhaps the man did it because he was bored. But they still made a promise. And ‘It’ had fulfilled its part of the promist. That was how ‘It’ repaid the man who introduced ‘It’ to the world of Math. The time was coming. The one who would complete the promise would be coming soon. ‘It’ closed its eyes, and waited patiently. There was no need to hurry. Didn’t he fail to ascend a thousand years ago due to haste? ‘It’ couldn’t make the same mistake again. The formation was strangely cold. The giant aura that suppressed everything inside, and the seven giant mountains weren’t a problem for him. But the strange coldness inside didn’t seem to be related to the formation. It seemed to be something that came from the location itself. Indeed, this was something extremely strange. This formation here was a formation, and at the same time, not a formation. It was something where a pocket of space was twisted a little bit, so that it would be completely cut off from the rest of the world. Most of the space that got cut off retained its original shape. This type of a formation was, for some reason, extremely strange, and at the same time, complicated. Cho Ryu Hyang fixed his glasses. He still had his special vision, didn’t he? The power to perceive the truth of every being in the world was nonsensically powerful when used in a formation. Cho Ryu Hyang, who had been leisurely walking through the formation, stopped and turned his head. The cave that suddenly appeared in front of his eyes. He could see the words someone wrote on top of the cave entrance. At the same time, he was clearly able to sense that the cold power that covered the inside of the formation was originating from this cave. This was it. Whatever hurt his teacher, it was inside here. He could feel it. Cho Ryu Hyang walked inside filled with absolute confidence. Whatever was inside, he wasn’t about to let it go peacefully. A feeling of rage pulsed within his body. Thanks to that, he was able to resist the power of fear. But Cho Ryu Hyang should’ve been careful. The thing inside was bigger than he had thought, and it was very much real. Jo Gi Chun felt the formation’s power using clay proxies. Because of that, Jo Gi Chun experienced what happened inside indirectly. However, Cho Ryu Hyang was taking on the energy head-on. That’s why the moment he came in, he looked up. He felt a presense there. And the moment he did so, he opened his mouth in surprise. Cho Ryu Hyang, believing that his eyes were broken, tried using the Faultless View of The World multiple times. But the thing in front of him did not change. It wasn’t an illusion. How could such a giant being exist? Cho Ryu Hyang’s brain stopped processing because he was so overwhelmed by the sight in front of him. He was frozen. He knew that things inside a formation tended to move a bit away from reality at times. But this was too much. How could a living being exist like this? This wasn’t even possible! While Cho Ryu Hyang was standing there in shock, ‘It’ moved. The dragon’s body smoothly slid off the stalagmite on the ceiling. 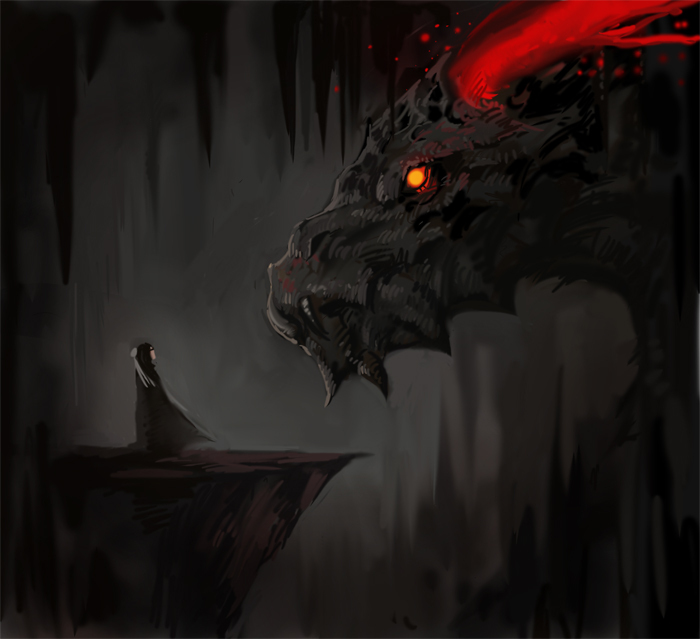 The two red horns resembling a crown, and the black, scales resembling obsidian. Lastly, the pair of golden eyes that seemed to stare straight into one’s soul. Those two eyes held incomparable joy at the moment. Dragon. No, the imugi made a satisfied expression. At the same time, Cho Ryu Hyang stumbled backwards with a pale face. Cho Ryu Hyang thought that at this point, he was used to strange and mysterious things. But this was on a completely different level. When the giant being approached him, Cho Ryu Hyang couldn’t breath. The aura the imugi exuded from its body was too powerful. Cho Ryu Hyang began to slowly walk away. But while he did so, he noticed something extremely strange. Even though the monster was clearly real, it didn’t have a number on itself. Unreadable. Since something like this had never happened before, Cho Ryu Hyang was extremely confused. The imugi spoke whilst looking at that. The moment the imugi stopped talking, one of the scales under its chin began to glow in red. Cho Ryu Hyang simply stood there, listening to the sound ring throughout the cave. Cho Ryu Hyang pressed on his chest with his hands. His heart began to beat extremely fast. Right then, the old man in his brain, spoke. At that time, Zhuge Liang made that promise on a whim. No, to be more accurate, he made the promise because it was interesting. He saved a dying being and made a pointless promise. But that promise eventually found its way back to him, a thousand years later. It was quite surprising, but at the same time, Zhuge Liang was amazed by the imugi that managed to keep the promise for a thousand years. It was true. Zhuge Liang could only admit it. Humans easily made promises, and easily forgot them. He couldn’t do anything about that. Zhuge Liang faintly smiled. He expected it once he saw the stone column outside, but to think the one in the formation would really be him. When he was thinking that, the boy asked him a question. Of course he did. But Zhuge Liang didn’t say anything. Things would only get annoying if he spoke. But Cho Ryu Hyang wasn’t an idiot. The boy managed to find out that the two had a sort of a relationship with each other. Cho Ryu Hyang was about to ask that question, but Zhuge Liang was one step faster. What promise? The moment Cho Ryu Hyang thought this, Zhuge Liang responded. The scale that turned red from heat. Strangely, it was a scale that faced an opposite direction from all the other scales. When Cho Ryu Hyang saw it, he could begin hearing the sound of his heart in his ears. Cho Ryu Hyang tightly held onto his chest. The area on his chest where the heart was located began to feel like it was burning. Zhuge Liang just kept on talking as if he didn’t know what was going on. It’s a ingredient that imugis need to become dragons? Zhuge Liang nodded. Cho Ryu Hyang’s heartbeats began to get louder. And once Cho Ryu Hyang’s couldn’t hear anything other than his heartbeat, Zhuge Liang began to talk to the imugi, whilst looking straight at the being with Cho Ryu Hyang’s eyes. The imugi could see a faint trace of the human from a long time ago, inside the little boy’s eyes. A strange, proud human that wouldn’t bow down to anyone. But thanks to this man, it would be able to get another chance to ascend. Zhuge Liang smiled at the imugi’s words. It seemed that he’d have to change his opinion about the imugi being a lowly life form. After all, the imugi was the only being so far that was able to understand his teachings perfectly. Plus, it was still alive, and it was able to recogize him in this state. That guy was pretty good. Zhuge Liang fiddled with feathered fan in his hands, and replied. Tian Nu (天怒: Heaven’s wrath). It was the name Zhuge Liang made for the imugi. The imugi spoke while looking at Zhuge Liang. A promise even Zhuge Liang forgot about. A long time ago, there existed people who could understand the words of Zhuge Liang. One was the imugi in front of him. The other was Pang Tong (鳳雛). These two were the only true friends Zhuge Liang had, the people he could talk to about math without holding back at all. A little at a time. A tiny amount…… The imugi had been using a miniscule amount of energy over the years to let the two meet. The imugi’s wish. Its wish was all too clear. And Cho Ryu Hyang had the power to fulfill it. Damn since I played Dynasty Warriors seeing Pang Tong just made me sad. Soooo epic ! Thanks so much for all your hard work!!! Wooohoo~! This is really getting exciting~! ah, meeting the Imugi! I didn’t exoect that kibd of relationship between Zhuge Liang and the Imugi! It’s…kind of moving!